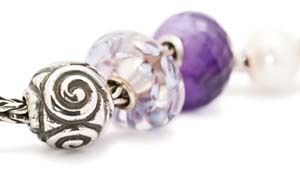 Joyful Sterling Silver Trollbeads, retired. A silver bead in a joyfully spiralling and curving pattern. We found looking at it makes you joyful! How much better does it get? It doesn't. But this is a limited edition so if you don't have one don't wait too long! Retired In January of 2016. Don't get me wrong I do like the new Joyful but there is something different and this is a good thing for the old bead collectors. Click the button below to add the Joyful Bead, Retired to your wish list.